Winter weather and friends together, it's time for holiday fun! Do you have a house filled with kids? Your kids, neighbor kids, grandkids? Would you like to get them away from their electronic devices and reconnect with them? Here are some no tech, low overhead, fun activities and games you can play to promote togetherness and the spirit of the Christmas season. Place Christmas items on a tray. Tell the children they have 30 seconds to memorize what's on there. Ask them to write down as many as they can remember in one minute. 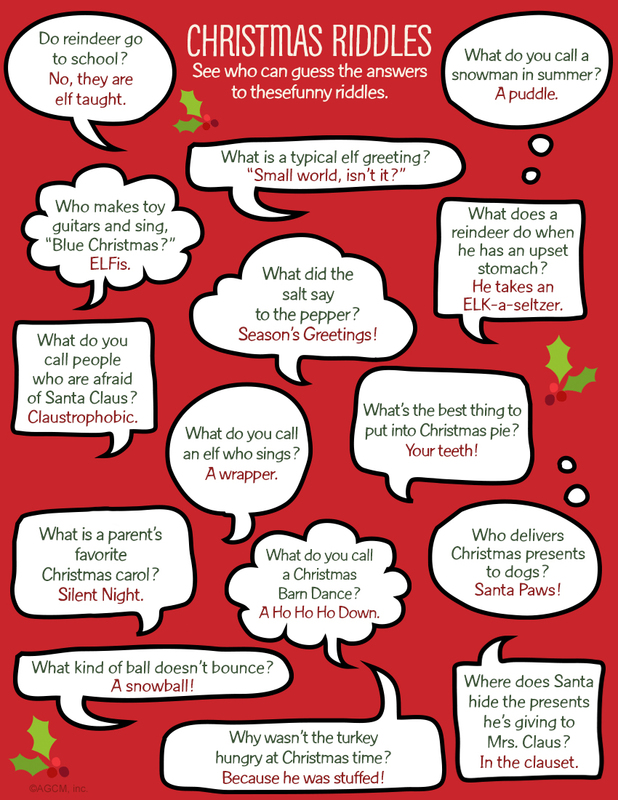 Play or sing the first lines of popular Christmas songs and see which child can come up with the name of it first. On a table, place large, plain sugar cookies and piping bags or squeeze bottles of colored icing. Provide sprinkles, candy pearls and other decorations. Give each child a plastic knife or wooden ice cream stick and let the fun begin! When they're finished, the kids can eat their creations, or wrap them and give them as gifts. Together with the children, make a list of things associated with Christmas, such as Christmas tree, star, reindeer, North Pole, etc. Then make a list of words that rhyme with them. Start linking the ideas, such as, "Once there was a Christmas star, that could be seen from near and far…" You're on your way to making a silly or sentimental Christmas poem that could become a fun gift or keepsake of the season. Provide some fun accessories for snowmen (and snow women), such as hats and scarves and buttons, and let the children's imaginations run wild. Prizes can be awarded for silliest, most original, or fastest built. The first child begins with "I decorated the tree with a _____" The next player repeats what the first player says and adds their own: "I decorated the tree with a _____ and a _____. Each player repeats the sequence until a mistake is made. This game usually dissolves into giggles because of the funny things the children say they are placing on the tree. Make a list of Christmas words, such as Christmas, Santa Claus, Poinsettia, Candy Cane, and Mistletoe. Have each child make as many smaller words from it as possible before the timer runs out. Some words found in Santa Claus include: us, act, ant, can, cat, sat, sun, tan, last. Ask the children to guess the total number of ornaments on the tree. The closest guess is the winner and receives an ornament as a prize. 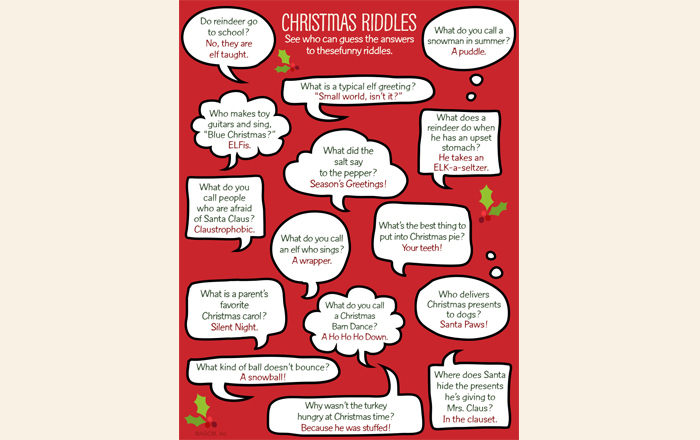 See who can guess the answers to these funny riddles. Here's a wonderful new holiday tradition you can begin with your family this year. 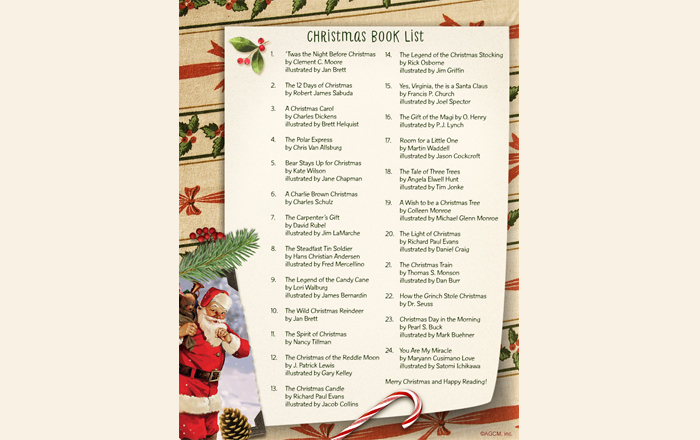 As a countdown to Christmas, wrap a special Christmas book for each day and number it. 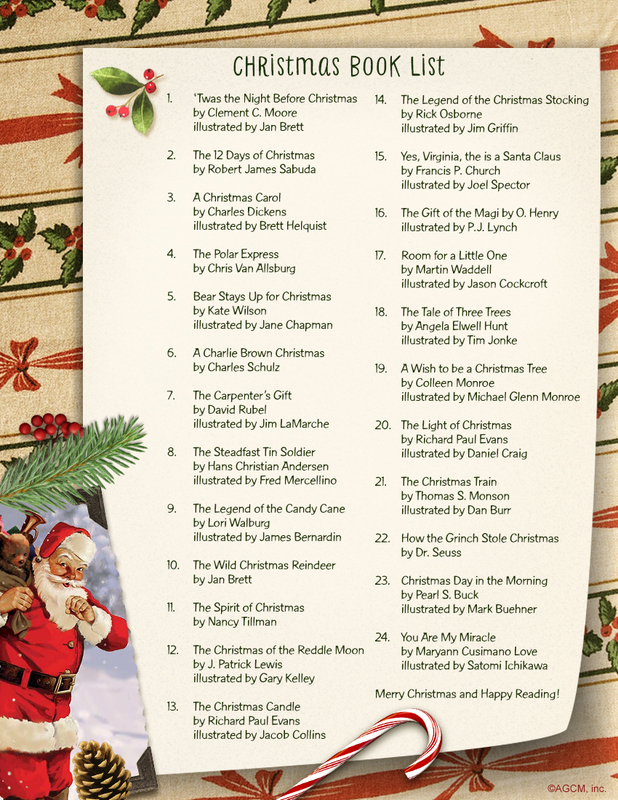 You can begin at December 1st with 24 books, or at any time in between. On each designated day, your child can unwrap one book that you will read together. These will become cherished keepsakes to be passed down through the years, so be sure to date and inscribe them with a heartwarming message to your child. Reading to children and toddlers enhances many of their skills: basic speech, logical thinking, concentration, and their ability to acclimate to new experiences. And if all that wasn't enough reason, reading together builds and even stronger bond between you and your child. To get you started, we've provided you with a list of 24 classic children's books and highlighted a few of our favorites. We've included the illustrators of the versions we think are especially charming. You can build your own collection over the years, or borrow them from your local library. So get cozy by the fire or under the covers and enjoy some good reading and bonding time with your family. While reading this classic poem aloud, it's fun for children to fill in the last word of the rhyming lines. The author's description of Santa has done more to form our image of Santa than any other work, and the beautiful illustrations of Jan Brett bring him to life. Award winning author and paper engineer, Robert James Sabuda, has created an amazing pop-up interpretation of the timeless song, "The Twelve Days of Christmas." Take a wonderful trip back to an unforgettable Christmas Eve in Victorian London where Ebeneezer Scrooge learns the valuable lessons of kindness, charity and goodwill. This 1986 Caldecott Medal Winner tells the story of a young boy's magical train trip to the North Pole to make his Christmas wish. Bear's friends keep Bear awake for Christmas. Through the traditions of finding a tree, hanging stockings, and singing songs, he discovers that giving is the best Christmas present of all. You can empathize with Charlie Brown as he laments the commercialization of Christmas. But in the end, the Peanuts gang will uncover the true meaning of Christmas and celebrate a Christmas miracle. If your child is just learning to write, you can offer to be a helper elf. Explain that it's always polite to inquire about the recipient. How is the weather at the North Pole? Are the reindeer practicing their flying for the big trip? What are the elves doing? Has he been checking his naughty/nice list? This would be a good point to tell your child why they are probably on the nice list. It's best to focus on the positive, and not turn Santa into a negative experience. Now your child can list the things he or she would like for Christmas. (Since you will be fulfilling the list, it's a good time to ask for details.) Depending on your gifting plans, you can set a limit on the number of things requested, or you can let their imagination run wild, with the caveat that Santa may not be able to fit everything on his sleigh. Be prepared with an answer if your child asks for something that doesn't come in a box. You can explain that making grandpa feel better or bringing mom home from a military assignment or finding a lost pet, isn't Santa's area. 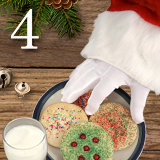 Your child can add that he/she hopes that Santa will enjoy the milk and cookies and reindeer feed you're leaving out for them. A good closing would include a "thank you" and a wish for a Merry Christmas! Add a stamp and some stickers and mail it to the North Pole. You can answer the questions your child asked and acknowledge what was said about being naughty or nice. 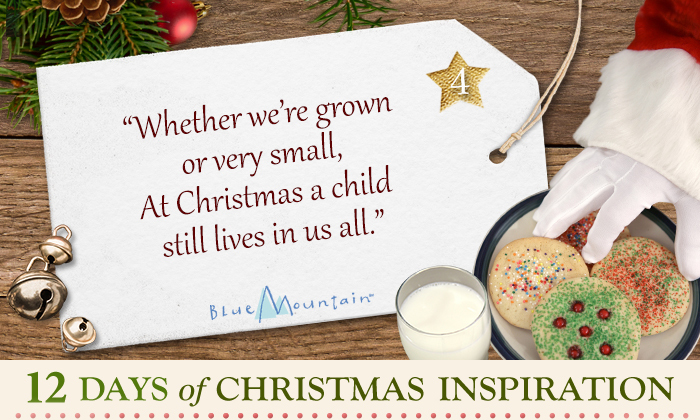 You can add that you're looking forward to landing at the house on Christmas Eve and having the milk and cookies. Ho ho ho! Think how fun and magical it will be when your child receives a personalized letter from Santa in the mail!